Several Metro Board members questioned the wisdom of adding any of the extra trains or buses for which riders have been asking. "But we have a bigger mission than that," said the agency's general manager. 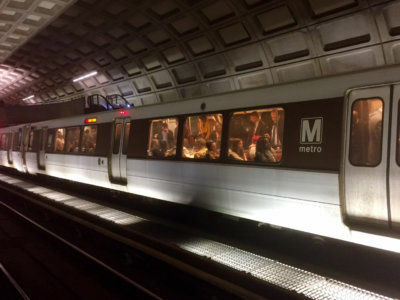 WASHINGTON — Metro’s mission to provide more service and help restore ridership has been at odds with a push to run the agency like a private business, relying less on taxpayer contributions. That tension led several Metro Board members Thursday to question the wisdom of adding any of the extra trains or buses for which riders have been asking. “We’ve got a constraint here. This is not a business where every new customer represents more profit for the organization. It’s the opposite,” said Trump administration appointee Steve McMillin, who acknowledged that getting more riders on existing trains would not increase costs. “It would be crazy for this authority to simply run more trains in off-peak times chasing additional passengers. That’s going to add to the subsidy that’s required for the jurisdictions, and the jurisdictions have made clear they want to see a 3 percent cap on that growth,” McMillin continued. General Manager Paul Wiedefeld pushed back somewhat after the meeting. However, that could require more taxpayer dollars, which Wiedefeld said means it is up to local governments to decide. “It can’t just be a dollars-and-cents equation,” Wiedefeld said. Metro Board Chair Jack Evans walked a tightrope between costs and service, saying that it is clear adding more service would draw more riders, especially at the times outside of rush hour when ridership has plummeted because of regularly reduced service due to Metro track work. Bus ridership continues to fall, too. Metro Chief Financial Officer Dennis Anosike, however, said that Metro’s aim is to lure riders back through “better customer engagement” and improved reliability of existing rail and bus service. Metro plans to launch new passes that may appeal more to occasional riders or visitors, too. Anosike dodged a question on how much the final total local taxpayer subsidy increase is expected to be next year, citing potential variations in the costs of paratransit service and the timing of the Silver Line’s Phase 2 construction. According to Evans, a District review of Metro’s preliminary budget details for the year beginning July 1 suggests taxpayers in Maryland, Virginia and D.C. could foot a bill for Metro’s operations that increases by 12 percent, far above the 3 percent cap on subsidy increases ostensibly required by new Maryland and Virginia laws. The increase would likely meet the requirements of those laws, given exemptions for costs tied to paratransit, safety requirements and the extension of the Silver Line to Dulles Airport and Loudoun County. The challenges and discussion are emblematic of Metro’s difficulties when considered as an independent entity rather than as a critical, integrated piece of the region’s transportation system. “When you add trains and riders, doesn’t mean we’re going to make more money,” Evans said. The region’s roads face a similar challenge. Wiedefeld strongly suggested after Thursday’s Metro Board committee meetings that he does expect to include some type of change that would increase service at some times or locations in the system when he unveils his full budget proposal in the next few weeks. “When we come out with the budget next month, you’ll start to see what we’re thinking on those,” Wiedefeld said. Any decision would be up to the Metro Board ahead of the final adoption of the budget in March. Evans, who also chairs the D.C. Council Finance Committee, said the District could pay the higher increase. Maryland’s Metro Board members made clear the Free State is not interested. “At least from Maryland’s point of view, this is going to be a big hit,” Michael Goldman said. An additional $25 million in operating cash for Maryland to pay — on top of new dedicated capital construction money — could increase the state’s bill by about $200 million overall beyond regular inflation, Goldman said. “To present something that asks more than that … may be a bridge too far,” he said. All of this assumes for the moment that the federal government renews or expands on its commitment of $150 million in special capital funding each year that began following the 2009 Fort Totten crash and that expires Sept. 30, 2019. Wiedefeld called an extension of that funding one of the most important big picture financial issues for the agency’s supporters to address over the next year. It is matched by $50 million each from Maryland, Virginia and D.C.